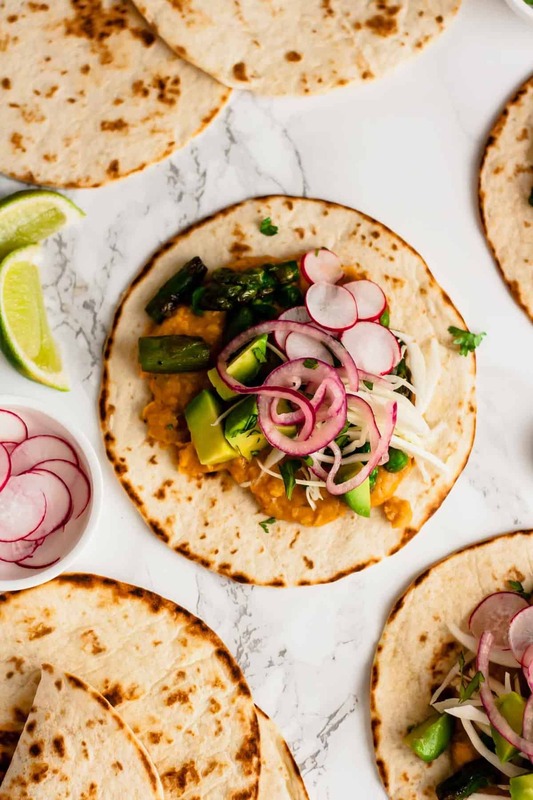 These Vegan Tacos feature refried cannellini beans, plenty of spring veggies and all the toppings! Hands up if you want tacos! See, I told you I needed more taco recipes! And these ones are vegan! As I mentioned in my last post, I’m currently in the middle of a 28 day challenge where I’m eating solely plant-based food (my husband is too!). And as such, all of the recipes I post here in the next few weeks will be vegan. 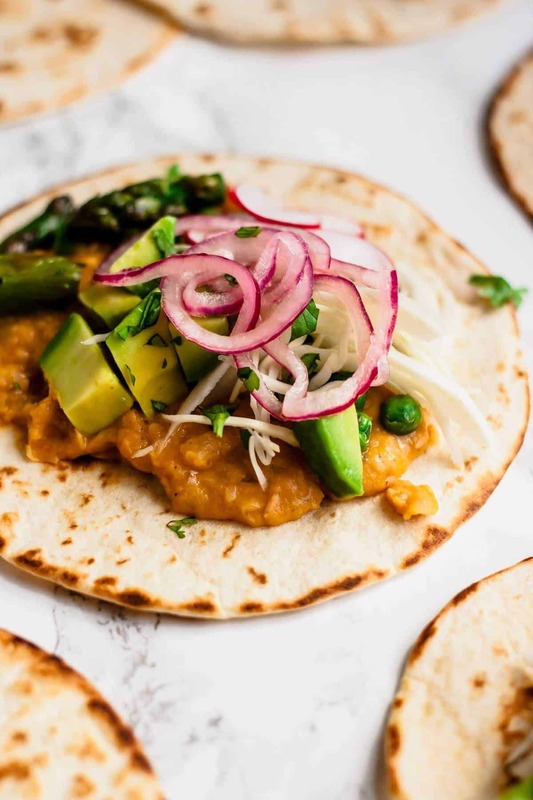 Starting with these Vegan Tacos with Refried Cannellini Beans and Asparagus! So, how’s the challenge going? It’s actually really fun! To be perfectly honest, I wasn’t worried about it at all before beginning, I was mostly just excited about the possibilities ahead! I find that cutting out such major food groups for a period of time really narrows my focus and opens my mind to new ideas! I especially love finding and using dairy alternatives – there are so many options out there! But yes, it’s going great so far. We’ve only had one minor slip up (some unlabelled pitta breads from the freezer which I think contained milk) and one minor meltdown (an inedible slow cooker chilli which led to an impromptu supermarket visit – thank goodness for frozen veggie burgers!). Other than that – all good! The only other thing is I need to up my snacking game and actually include snacks in my meal planning! Am I the only person who fails with that one? Please leave any recommendations for tasty plant-based snacks in the comments, thanks! The one thing I find myself craving the most is a creamy texture. I adore cheese, yoghurt, etc, so it’s no surprise really! One of my favourite meals that I’ve eaten has been a thai green sweetcorn soup from this book by Alice Hart (affiliate link), which was made creamy by both coconut milk and blended cashews. Heaven! Another way to add a ton of creaminess to your meal is to add refried beans! Or any kind of beans really, but refried beans are just the best, no? Especially when combined with all the taco toppings you can think of! 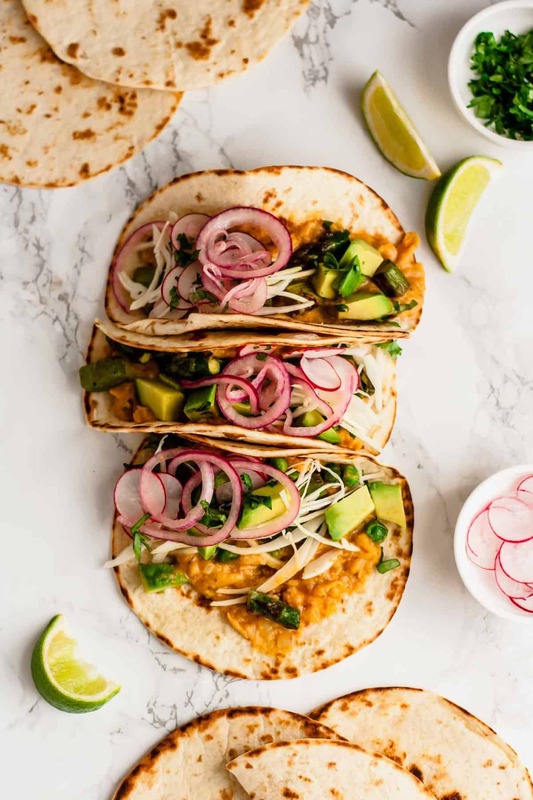 I adore regular refried beans made with black beans but I wanted these vegan tacos to be super light and springy! Cannellini beans sounded just perfect to me and guess what – they were! These refried beans are so simple to make and they’re packed full of flavour. I paired them with some lightly sautéed asparagus and peas and plenty of crunchy and creamy toppings. I’d like to say they’re optional but to be frank, none of them are! Especially the pickled red onions, I could eat those by themselves! 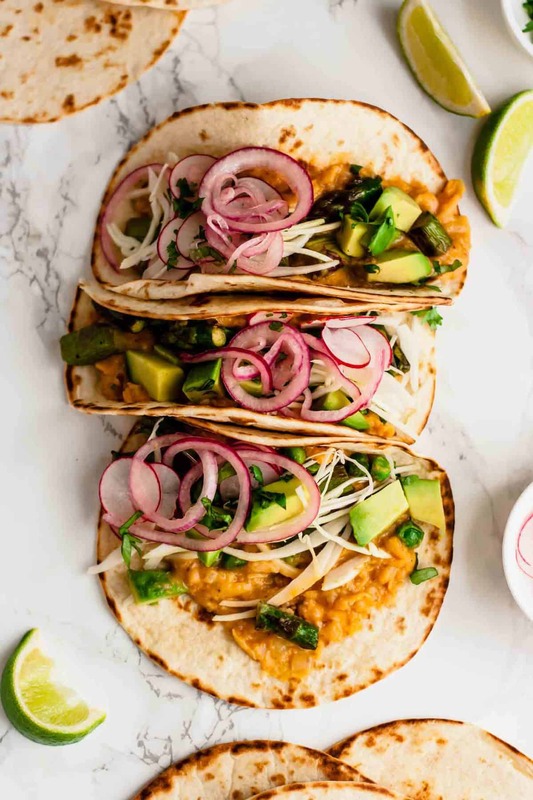 I hope you love these vegan tacos as much as I do! If you make them, please leave a comment below or share a picture on Instagram with the hashtag #eatloveeats! I love seeing your creations! Heat 1 tablespoon of the oil in a small saucepan. Add the diced shallot and sweat for 1-2 minutes until softened. Add the spices and cook for another minute. Pour the entire can of cannellini beans into the saucepan (don't drain!) and bring to a simmer. Gently mash the beans with a potato masher or the back of a wooden spoon until they're mostly broken down. Simmer over a medium heat for 5-10 minutes until thickened. Season with salt and pepper to taste - bear in mind that beans can take quite a lot of salt so you might need more than you think. Snap the woody ends off the asparagus and cut into short lengths - about 1cm. Leave the tips intact. Heat the remaining oil in a frying pan over medium-high heat and add the asparagus and frozen peas. Saute for 5-10 minutes until golden and the asparagus is tender. Season to taste with salt and pepper. I like to warm my tortillas in a dry frying pan so that they get a bit browned and charred but you can warm them in the oven if you prefer. 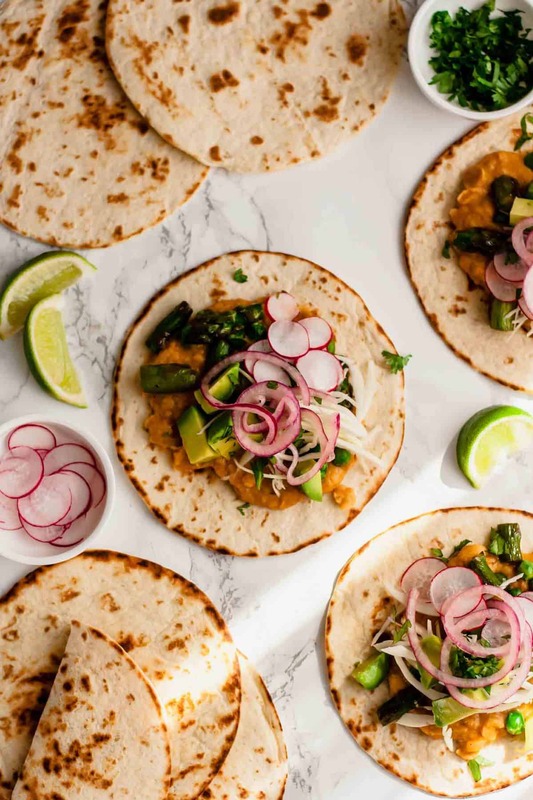 Serve the warmed tacos with some refried beans, asparagus and peas and lots of toppings! Ingredient swaps: Try using courgette/zucchini in place of the asparagus. To make pickled red onions: I don't use a recipe for these, I just finely slice a red onion and add a big pinch of salt, about a teaspoon of sugar, a few tablespoons of white wine/red wine/apple cider vinegar and a splash of water. Stir well and leave to pickle for at least 20 minutes before using.